Ever wanted to travel back in time? Well, you can (sort of) in this impressive 3D video slot from Betsoft. But who is Miles Bellhouse and what's so curious about his Curious Machine? Find out right here in our comprehensive slot review. 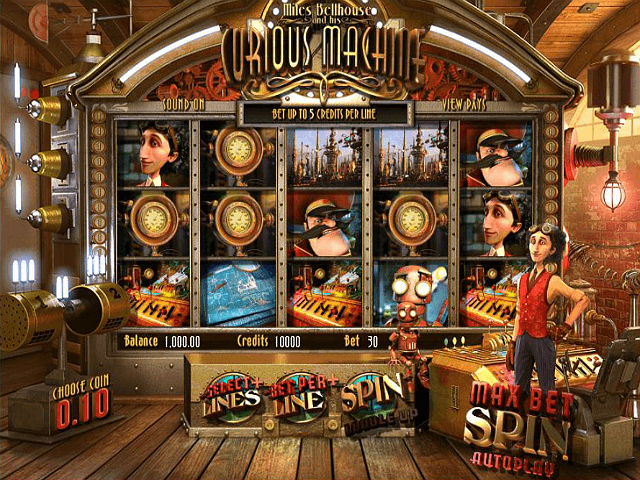 Play Miles Bellhouse and his Curious Machine Slot Demo for Free! 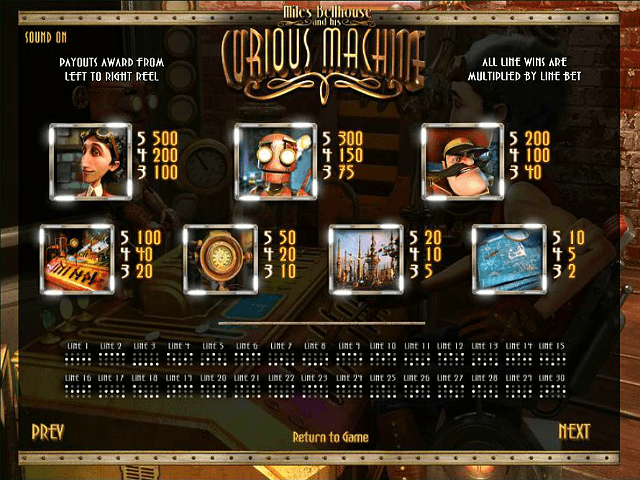 Play Miles Bellhouse and his Curious Machine for Real Money! 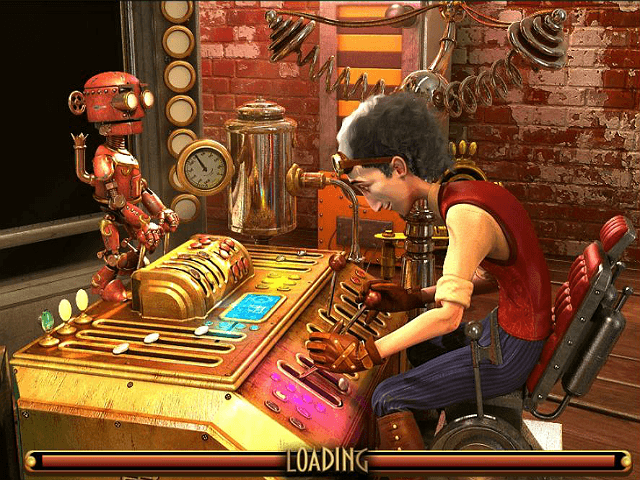 The Miles Bellhouse and his Curious Machine slot game is an original creation that revolves around a fictional inventor and his time machine. It’s certainly a distinctive theme for an online slot and lends it a strong storyline. When you open up the game, the first thing you’ll notice is that it doesn’t look like your typical slot. The action takes place in the inventor’s workshop with the reels subtly blended in and an uplifting, dramatic soundtrack fitting the style perfectly. Winning combinations trigger animations involving the winning symbol, while Miles and his little robot celebrate with you. Betsoft has gone to great lengths to make this a realistic and immersive game. It might take a few seconds to work out all the controls, but once you do you can have a lot of fun. After you’ve taken in the sights and sounds, it’s time to set your stake. Decide how many of the 30 paylines you want to bet on, then choose your coin value from 0.02 to 0.50. Finally, select the number of coins you want to play on each line between one and five. There are seven main symbols as well as the three bonus icons. The best of these is Mr Bellhouse himself, who rewards you with 2,500 coins if you land five on a payline. His robot sidekick is second-best, paying out 1,500 coins for landing five. Paylines run from left to right and as usual you can view them by clicking on the ‘view pays’ tab. As mentioned, our friend Miles Bellhouse has been kind enough to invent a few bonus features to increase your chances of winning. The first one is the vortex symbol, which is the wild. If no wins occur and the vortex is present, any icons touching it will re-spin. Then there’s the Second Chance feature, which happens at random. One of the five reels will spin again to give you another opportunity to win. Note that Second Chance can be activated only when all 30 paylines are in play. Miles Bellhouse takes you back to prehistoric times in his Blast to the Past Free Spins round, which is unlocked by landing three or more of the dinosaur scatter symbols. You get ten free spins and each one comes with a random multiplier up to five-times. After every win in the base game, you have the opportunity to double your winnings with the Double Up feature. Simply click on the ‘Double Up’ button and you’ll be taken to a new screen where you have to guess which hand the robot is holding the coin in. Get it right and your pay-out will be doubled, but get it wrong and you lose everything. 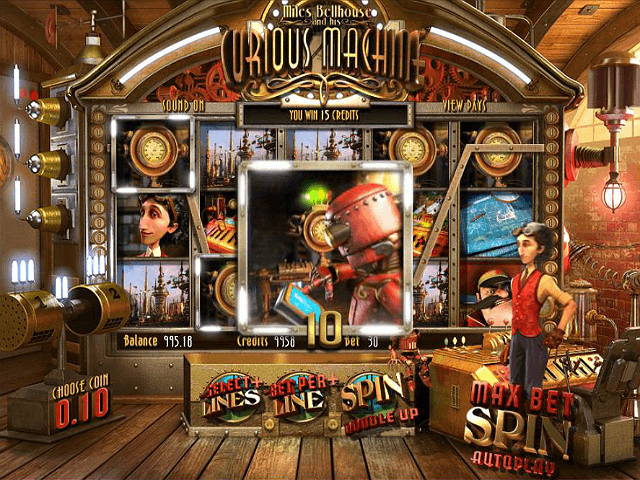 The final icon is the image of the machine’s controls – three or more of these trigger the Travel Through Time feature as Miles and his robot companion flee the suspicious general in a second-screen bonus feature. We hope our review has made you curious to try out this innovative slot, and that Mr Bellhouse treats you well! 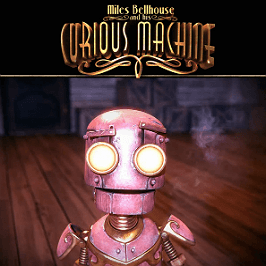 Share this Miles Bellhouse and his Curious Machine Review today! If you like Miles Bellhouse and his Curious Machine, you'll love these slot titles too!